Rose Frederic, 14, has her eyes checked by her father, Biencher, nicknamed Freddy, at their home in Naples on Friday, August 3, 2018. Rose has cirrhosis of the liver and will be scheduled for a liver transplant as soon as she gets approved for a green card, which has been a long process amid the current immigration issues. Freddy says he constantly watches his daughter out of fear that her condition will worsen. Spike the alligator sits in the middle of the classroom during an "Alligator 101" presentation by FWC alligator trapper Ray Simonsen at Laurel Oak Elementary on May 25, 2017. Lily Nagel, 9, shares a moment with Penny the pony during a summer equestrian session at Cornerstone Farm South in Naples on Friday June 15, 2018. Maille Duffy, 8, left, opens her mouth in shock as her mom, Samantha Duffy, finishes her last spoonful of ice cream during the Where to Eat 239 Kitchen Sink Challenge at Royal Scoop Homemade Ice Cream at Berkshire Place in East Naples on Monday, July 24, 2017. The food challenge requires participants to finish around 6 pounds of ice cream, waffle cones and various toppings in one hour. 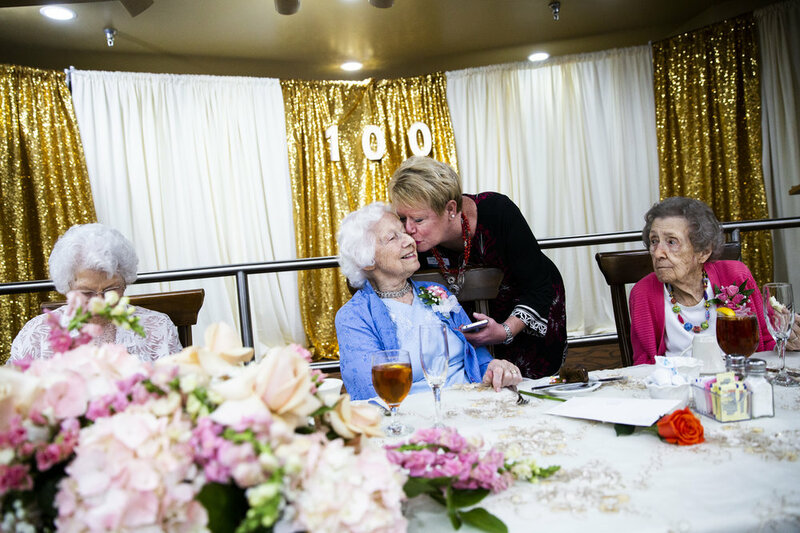 Stephanie Janke, an activities assistant, kisses Vesta Warner, 100, on the cheek to wish her a happy birthday during a celebration for the six resident centenarians at the Lely Palms Retirement Community in Naples on Wednesday, July 18, 2018. Brittnie Rowan, left, listens to speakers while Shawn McAskill holds their son, Ethan McAskill, a 5-year-old kindergarten student, during a gun control rally in front of the federal courthouse in Fort Lauderdale, Fla. on Saturday, Feb. 17, 2018. Students, community members, elected officials and gun control advocates gathered together to call for common sense gun laws and firearm safety legislation in the wake of the school shooting that left 17 people dead and 15 others injured this past Wednesday in Parkland, Fla.
Renald Richard, 91, plays the trumpet during a jazz jam session at the home of Jim Gover in Naples, Florida on Tuesday, Oct. 11, 2016. Richard was Ray Charles' former band leader and co-wrote his hit song "I Got a Woman." "I was asked, 'Would you be interested in playing with Ray Charles?' Now that's like asking if a baby likes candy." 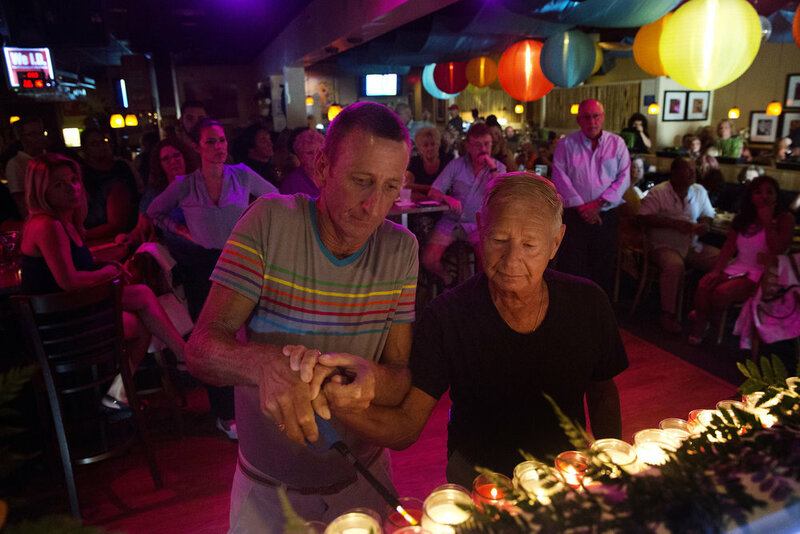 Mike Robichaud, 52, left, and Frank Cardone, 78, both of Naples, light a candle for one of the victims of the Orlando shooting at a vigil held at Bambusa Bar and Grill on June 16, 2016 in Naples, Florida. Besides lighting 49 candles to honor each of the victims, Bambusa also hosted a fundraiser auction to raise money for the survivors and the victim's families. A brush fire burns near Frangipani Avenue in Naples on Thursday, April 20, 2017. Over the course of four days, the blaze scorched a total of 7,500 acres, injured one person and damaged five structures. In this double exposure photo, Gov. Rick Scott addresses the press during the first media briefing on Thursday, Feb. 15, 2018 outside of Marjory Stoneman Douglas High School in Parkland, Fla., where 17 people died and several others were injured after Wednesday's mass shooting. Jessica Riner cries as she hugs a friend after hearing the verdict for Rene Miles, who was found guilty of a felony DUI manslaughter charge for the death of her husband James “Cecil” Riner, at the Collier County Courthouse on Tuesday, June 20, 2017. Brigitte Butz leans on Alex Perez's shoulder as they slow dance during the 28th Annual Valentine's Dinner Dance at Emmanuel Lutheran Church in Naples, Florida on Friday, Feb. 10, 2017. Naples Civitan Club hosts the event for members of the Foundation for the Developmentally Disabled. Armond Procacci, top right, strikes a pose as Elvis while performing with the Gulf Coast High School marching band during the halftime show of the Catfish Bowl at Gulf Coast High School in North Naples on Friday, Oct. 6, 2017. Competitors warm-up before their heats for the Youth DanceSport Challenge at the Arnold Sports Festival in Columbus, Ohio on Saturday, March 7, 2015. Republican presidential nominee Donald Trump animatedlyspeaks to the crowd during his rally at MIDFLORIDA Credit Union Amphitheater in Tampa, Florida on Monday, Oct. 24, 2016. 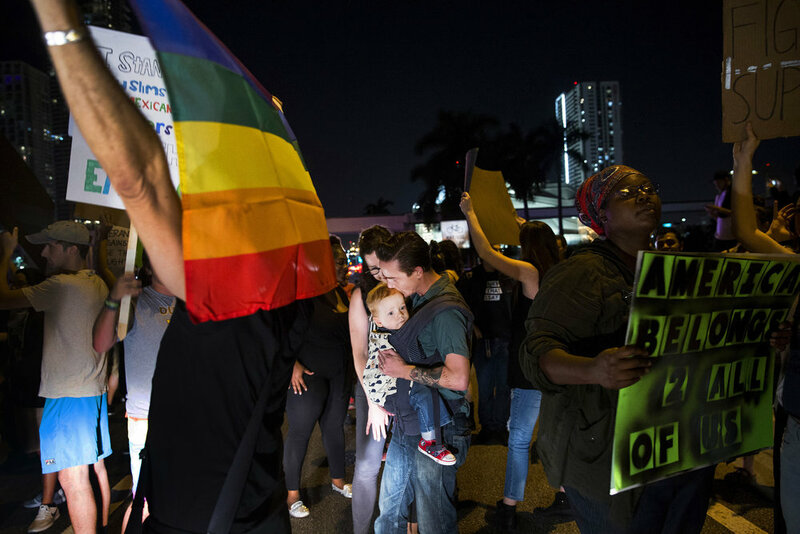 Patrick Griffin, center, kisses his son Patrick Griffin Jr., 18 months, during a non-violent anti-Trump march and protest in downtown Miami, FL on Friday, Nov. 11, 2016. According to one of the group's Facebook pages, the march aimed to warn the people against the dangers of a man like Donald Trump, particularly the encouragement of outspoken hate, racism, anti-islamism, and misogyny. In this double-exposure photo, the audience watches a laser light show set to the music of Metallica at the Calusa Nature Center & Planetarium in Fort Myers on Sunday, June 18, 2017. A man takes a photo of the Pole Fitness performer at the Party with the Pros event, the Official After-Party of the Arnold Classic, at the Hollywood Casino in Columbus, Ohio on Saturday, Mar. 8, 2015. Saran wrap covers an empty gas pump at a BP Gas Station in Fort Lauderdale, Florida on Thursday, Oct. 6, 2016. Several stations were left completely without gas as residents prepared for Hurricane Matthew to hit the east coast. Jack Cannon, 14, from left, and Salvador Figueroa, 13, both of Bonita Springs, ride their bikes through the flooded walkway as Jerry Rabin enjoys the scene from a bench in Riverside Park in Bonita Springs on Monday, August 28, 2017. Miss Dorothy “Dot” Lee, 71, files Trouper the Raccoon's nails during a presentation at the Marco Island Library on Thursday, Sept. 22, 2016 in Marco Island, Florida. Miss Dot, a licensed wildlife rehabilitator, and Trouper, a blind wildlife ambassador, visit children and adults all over Florida in schools, groups and organizations to teach about respect and love for all living things.